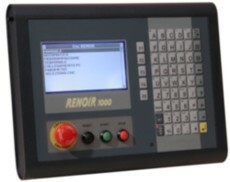 The S & H GOYA, RENOIR and RUBENS controllers are CNC multi axis controllers for automatically controlling machines using stepper or servo motors. They are designed for synchronised motion where two or more axes are run simultaneously. Motion programs are written in ISO (G-Gode) which is easy to use and is familiar to most CNC machine operators. 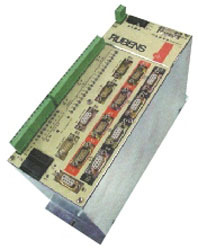 Programs can be written using the BACH PC based software which allows operators to edit and verify programs before downloading them to a controller via RS232 port. If you don't want use the S & H software, it is possible to send the program files as ASCII characters using other software. Programs can be stored in the controller and executed as required. The PC does not have to be connected all the time. Typical applications are XYZ profiling tables, pick & place, automatic welding, engraving, packaging machines, glueing & painting. The ISO programming used 'G' commands to define type of motion and 'F' commands to define speed (called 'feed'). A typical example is the program to cut out the shape below, using a three axis outer table. The main motion commands are G00 (rapid movement), G01 (interpolated linear movement and G02/G03 (circular arc movement). About 50 'G' commands are available with the S & H controllers. All the controllers use the same programming language and PC software to edit and download programs, ensuring compatibility between systems.